Final Cover for the Minicomic Collection from Dark Horse! 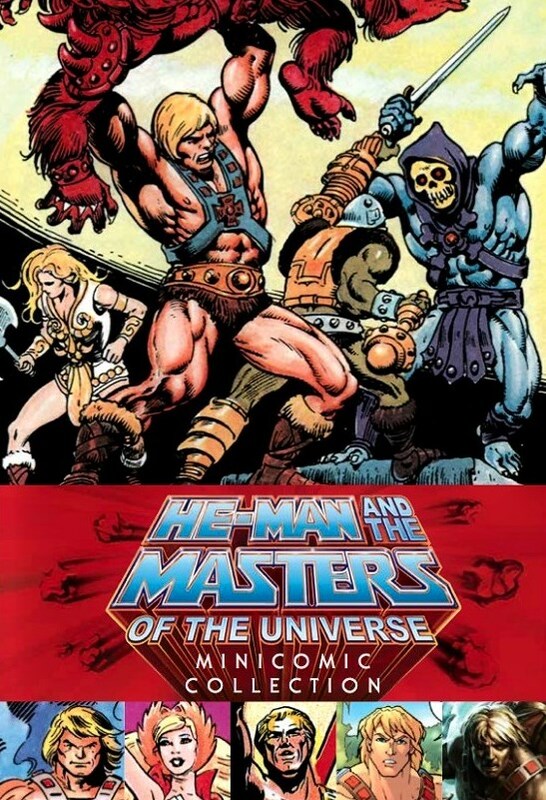 Take a look at the finalized cover for the He-Man and the Masters of the Universe Minicomic Collection from Dark Horse Books! You can pre-order your copy of the book by clicking HERE! Cool that they've chosen Alcala's art here... Can't wait to get my copy. I don't care what's on the cover I'm just glad they are even doing this. Which I think is neat. Cool. Matches well with the art book. There was a 10 page promotional 200X mini-comic given away with the Nintendo Game Boy Advance game "He-Man: The Power of Grayskull" from TDK. The art on the cover comes from the full-size 200X comic that came with the Target 2-pack exclusive He-Man and Skeletor. Although it wasn't a mini-comic, it did come packaged with the toys. The He-Man on the cover is on the page below. Huh, I have that 200X comic in my collection somewhere! Is that third image New Adventures He-Man? If so then that is really cool, I am a big fan of that series. I will definitely have to look into these. I say... it's a crime that all minicomic book related discussions here dried up. For any interested, here are compilation of links with preview pages. Including Pixel-Dan's link. This thing is really the item of the year for me! Well..I can't wait for this to come out...lifelong dream and all that. Good to hear Return from terror island is going to be included. I heard it also looks to be listed for pe-order at a few B&M stores like wal-mart and Barnes & Noble. I hope to walk in come November and actually see that, plus it would be great if it gets some exposure to the property. Yeah, can't wait to sit down with my kids and go through this thing cover to cover. They'll be in heaven... and so will I!!! So excited for this release. Wish we could see a shot of the spine to see how big it really is. Awesome, thanks!! Damn that thing is mammoth!! Very excited about this mini comic compilation. Love to get a copy. Those stories and especially art bring back memories to me from back in the childhood days. This was stuff that dreams were made off. 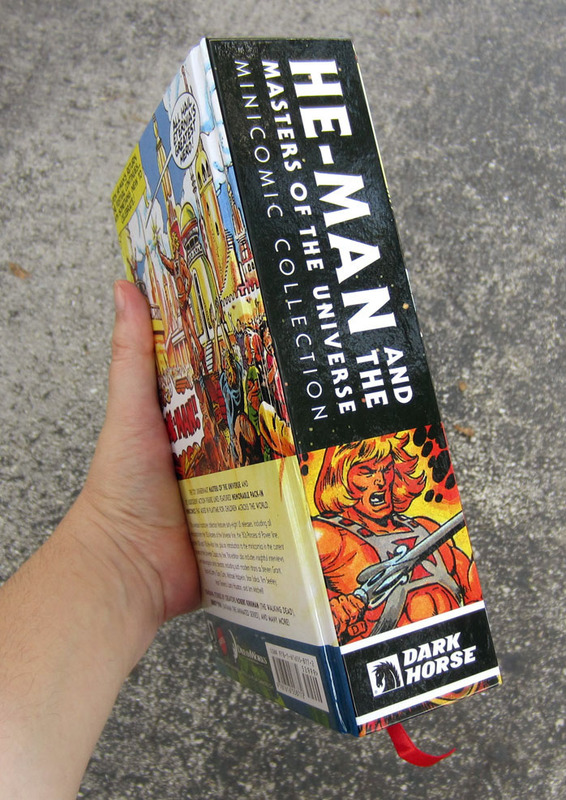 How cool it would if next book would contain he-man comics,shera and new adventures from those published for europe through england,german ehapa and from various he-man and she-ra magazines from us. Along those comics include the posters that were part of magazines. Final book should include toy catalogs for all decades of motu,pop and NA and those wonderful german toy catalogs were toys were displayed in actual dioramas with a story. I might see this at my comic shop today. I ordered this from Amazon, so waiting is going to be torture! Yeah, waiting for it now will be even more agonizing!... Come on Amazon, just send it already for those who pre-ordered it a while back! I don't think it's Amazon's decision. I think this is a way for companies to help local stores stay competitive--early release to counterbalance Amazon's discounts. I went into BAM! today, they had the artbook but they won't have the mini comic collection until Nov 3rd. I can't wait to get my hands on this book. Amazon has it for about $18. That's astounding! It's only a few days away until we all get two read two unpublished mini comics. It's a real kick in the pants that the Secrets of the Powers of Grayskull might be "gone for good". Perhaps this collection will spark more conversion? Off all the people interviewed, and all the "Did you know" facts you compiled, if there any (besides Bruce Timm) that you would have like to have included but did not? Amazon is preparing my copy for shipping. Also, I notice that it's going to be available in Kindle format, but split into 2 volumes. ($9.99 US per volume) Given the sheer size of this thing, I'm not surprised. It's out in stores! Actual brick & mortar stores. Please excuse my absence for a few...you know I'm going to be busy reading it. Mine should be arriving today, hopefully. Edit: I just opened it up and looked through it quick. The quality of the paper (and the binding) isn't the greatest, considering its price range, so who knows if it's going to hold up over time after multiple reads!... I might get another copy in case this one starts falling apart on me down the road! Last edited by Mechanizor; 11-04-2015, 05:15 AM. Mine arrived from Amazon on Wednesday. Very happy to get it, and love the fact the price dropped to $19.95 CAD w/ free shipping. Haven't had too much time to read through it yet, but it's great to hold Alcala's artwork in my hands again. Got mine... and for a price drop too. Very cool!! There are currently 109 users online. 1 members and 108 guests.